Thinking through solidarity organizing, with an eye to how we can better live the change, as well as how we often slip in to colonial patterns when working together across distance and difference. An intense semester is finally winding down and I'm ready to post again. Thanks to my friend Rachel for sending this bizarre empathy experiment my way. 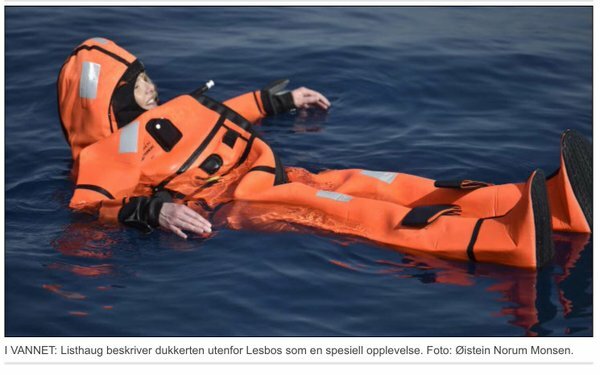 The odd picture here is of Norway's immigration minister, Sylvi Listhaug, supposedly trying to get a sense of what it is like to be a refugee and lose your boat in the Aegean sea. It seems to me that she was actually promoting the work of the Norwegian rescue ship, which pulled her out minutes later. Not surprisingly she has received a fair bit of criticism online, particularly about her wearing a survival suit during the exercise. Said one, “Tonight I’ll sleep with the window open to feel what it’s like to be homeless." My critique is not about her suit, but about the entire exercise. Do we have to experience what it is like to drown or nearly drown to be moved to take action in solidarity with the refugees? Would they really want anyone to have to experience even the slightest bit of the horrors they have faced? It reminds me of my wise friend Patricia Isasa, a torture survivor, telling me something like 'of course you could never really understand what it is like to be tortured - and why on earth would I want you to?' As I repeatedly have argued here, we do not have to pretend to be each other to be in solidarity with each other. our brains were built for this? Imperialism Within: Can the Master's Tools Bring Down Empire? my other blog, Spanish for Social Change, is a weekly look at translations of social justice movement terminology. The last few entries are below.